Indeed, on October 15th 2012, I began my participation in the KickLabs program in San Francisco, ranked as #3 accelerator most successful for startups in the US. While others are running multi-thematic programs, and dozens of companies in a batch mode, KickLabs focuses on “revenue generating digital marketing startups”. Alumni include: Kiip, Scan, Livefyre, Real Gravity, Tout, Mylikes, Buddy etc. So, let me tell you the story of what being at Kicklabs has meant for me and my company. The first time, I heard of KickLabs was through Brian Wong (founder of Kiip), in Luxembourg at a tech event in June 2011. He suggested that I check the KickLabs website. I did, and well, I didn’t see the added value at first. A few months later, I was spending several weeks in the Valley: networking, prospecting for new partners, and even presenting to investors, read my 10 Don’ts when moving to the Silicon Valley, I did it all! I started to think about this KickLabs thing again. “Accelerating startups path to success… connecting them with brands and agencies”. I started to become more interested into the program and applied for it. I was accepted. The main goal of being at KickLabs was our desire to launch www.doz.com, our product made for the US market. Launching a new product is almost like starting over. Even though we were running Capseo in Europe for 3 years, and had a deep understanding of our clients’ needs, we still had to figure out how to reach those clients in the US, create the right message, target the right segment, pricing, branding etc. Each week at KickLabs was started with a “mentor session” where we had to go through the progress and the overall strategy. It was also the best place to practice pitches. I was lucky to get feedback from Chris, Peter and Rick; All three had success as entrepreneurs and investors, in the Digital Media industry… so their advice was like gold. Presenting your vision and the company’s next big steps or issues, to people who are listening and genuinely care about what you are building, is extremely motivating. The KickLabs network also helped me to schedule targeted meetings with CEOs of Digital Agencies, alumni of the program, advisors, potential investors etc. Silicon Valley is all about connections, so having access to a deep network is a really important asset. Another strength of the program is its internal resources. We had the privilege to be helped by two amazing business analysts: Takehiro and Nick. Takehiro was an invaluable resource for our competitive analysis, financial forecasts and partnerships strategy. Nick has done an incredible job by putting together a white-paper on the movement we are now leading, called “Prosourcing”. KickLabs offices are located in Rocketspace, one of the most dynamic and inspiring co-working spaces in the Bay Area. Rocketspace is an entrepreneur friendly building, where you can also feel the competition of everyone else aspiring to succeed. Being based there was also a means for high motivation. Being part of KickLabs has also impacted my personal attitude toward business and ambition. KickLabs helped me look at the bigger picture, and empower the vision I have for my company. When your focus has been on the daily business for three years, it’s good to take time to analyze what has been accomplished, and what still can be achieved. The founders of KickLabs created a program called The Last Mile, an incubator inside San Quentin State Prison, check my post about its demo day. This type of initiative makes KickLabs a human organization. The bet is made on individuals not just on figures in excel spreadsheets. KickLabs put us on the right track, but it’s just beginning. 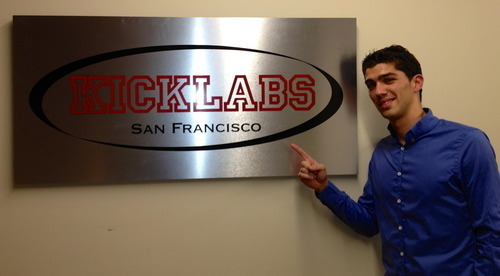 I’d highly recommend that startup founders in the Digital Media space, move to the Bay Area, and consider KickLabs. Big thanks to the KickLabs Team: Peter Boboff, Rick Borenstein, Tulio Cardozo, Nick Mathers, Beverly Parenti, Chris Redlitz, Takehiro Sugitani.